As an entry-level model in the range, the Box Semi-automatic has always been a success and represented the best proportion between investment and efficiency. The natural evolution of this model brought to development of the automatic version. Due to the different diameters of the rotation unit 300-500-800-1000mm the range covers completely any type of product category over a large variety of shapes and sizes. Versatility, usability, robustness, reliability, the use of materials which reduce wear and spare parts, and caps the maintenance costs, brings the product to the top of its class. 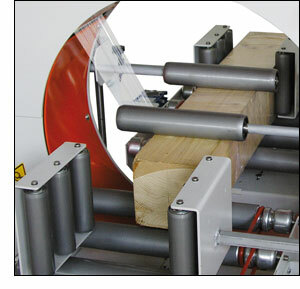 Banding and spiral machines for a large variety of products with different sizes and shape. All type's of products can be wrapped from profiles in wood, plastic and metal, aluminium extrusions, tubes in plastic, textile, cardboard boxes, shutters, awnings, panels in wood or metal, doors, flaps, all types of furniture. Compared with the semi-automatic model Box-S, the Box-A cycle is fully automatic, very flexible and easy to use. They can be used with or without the aid of the operator, in fact they are pre-designed to be inserted into completely automatic lines. Structurally, compared to the semi-automatic series BOX-S they are equipped with belt conveyors, photocells to detect the product andvertical pneumatic pressures to stabilize the product during the wrapping with the 6 banding programs.